Stock # PF133840, Turbocharged Diesel V8 6.6L/403, Automatic, 39899 mi. 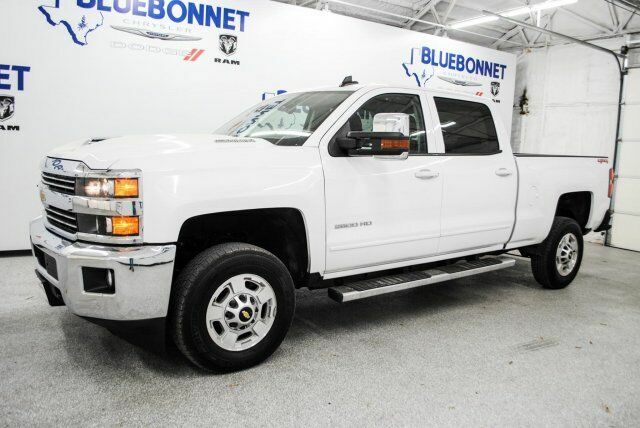 Rule the roads in this summit white 2018 Chevrolet Silverado 2500 HD LT 4x4 Crew Cab pick up at a fantastic deal today! This great truck features tinted windows, a bed liner, nerf bars, touch screen display, MP3, OnStar, a backup camera, cruise control, fold away rear seats, and so much more. This vehicle's powerful 6.6 LTR V8 Turbo Diesel engine is in great working condition for excellent towing capacity! The tires have at least 3/4 of their life span left, & the mileage represented is 100% accurate. With a smooth shifting automatic transmission & all power equipment working properly, each ride will be one of excitement & pleasure! If you have any questions about this amazing find or any of our other vehicles, please call our sales office. Thank you for your interest & we look forward to hearing from you. TRAILERING EQUIPMENT Trailering hitch platform 2.5" with a 2.0" insert for HD, 7-wire harness with independent fused trailering circuits mated to a 7-way sealed connector to hook up parking lamps, backup lamps, right and left turn signals, an electric brake lead, battery and a ground, The trailer connector also includes the 4-way for use on trailers without brakes - park, brake/turn lamps Includes (JL1) trailer brake controller. TIRES, LT275/65R18E 123/120Q MAXIMUM TRACTION BLACKWALL Goodyear Wrangler DuraTrac. Aggressive tread may result in a higher level of noise while driving. Routine tire rotations are strongly recommended.